Battery monitors and testers determine the health and operating capability of batteries. Sometimes known as battery management devices, they can monitor charging levels, voltage and temperature indications, or other conditions as part of more sophisticated battery management systems (BMS). For instance, in a power plant backup batteries are the last line of defense against a shutdown. A battery management system ensures reliability and is a critical component for effective operation. The goal of battery management devices is to ensure battery functions and maximize lifespan. Several variations exist, from sophisticated smart battery monitors to simple V-meters and Ah-counters that measures capacity consumption. Battery management devices provide feedback for corrective action if any diminution of battery function is indicated. They also provide data such as battery charge state. These devices extend a battery's lifespan and lead to cost savings. Voltmeters: These devices read a battery's voltage level, but don't adjust for factors-such as the effect of charging on battery capacity-that can lead to battery charge measurement inaccuracies. Deep cycle batteries experience a significant reduction in their lifespan when they are repeatedly discharged too much. A voltmeter for battery monitoring can shorten a battery's effective lifespan by providing misreadings. Ah-counters: Provides a simple measure of the charging hours available in a battery. However, these units do not calculate Peukert efficiency, possibly leading to measurement tolerances. Multi-function battery monitors: By utilizing Peukert efficiency, temperature and other variables such as charging statistics, these monitors provide precise information about a battery's operating status and capacity. Passive regulators: These devices aid in balancing batteries or cells by bypassing charging current if the voltage of a cell attains a particular level. Voltage alone does not accurately reflect a battery's operating charge, limiting their usefulness. Active regulators: These monitors turn a battery load on or off in order to balance a load. Less sophisticated models use cell voltage to accomplish this, while more advanced models evaluate other parameters. Distributed: In these systems one communication cable connects the battery and the controller, with a BMS board in place at each cell. They are the easiest to install and assemble and are typically the most expensive. Centralized: A centralized system uses a set of wires to connect the battery cells with a single controller. They are the least expensive type of BMS, as well as the most difficult to maintain due to the multitude of wires required. Modular: Several communication-enabled controllers are used, each monitoring a number of cells. Modular systems are categorized between distributed and centralized systems based on expense, ease of operation, and assembly. Battery capacity is calculated in Amp-hours (Ah). For instance, if a battery can deliver a current of 10Amps for 10 hours it would be rated at 100Ah (10 x 10 = 100). 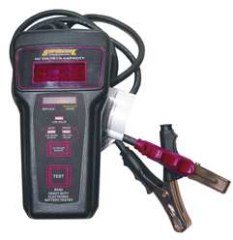 Battery monitors and testers measure the flow of current into and out of a battery, as well as other values. The device calculates how much energy is taken from or added to a battery. Simply relying on Amp-hours, however, does not provide an accurate picture of a battery's charging capacity. Temperature, the age of the battery, and discharge current all serve a role in battery capacity. As a result, a battery may discharge fully and more rapidly than might be expected due to its Amp-hours rating. This is known as Peukert efficiency. Low temperature can decrease a battery's capacity even further. Advanced battery monitors and testers display Amp-hours removed from a battery and state of charge (SOC) readings compensating for Peukert efficiency and temperature. The devices report important parameters such as voltage, current, and internal and ambient temperatures. If the monitor detects battery operation is poor, data is transmitted to produce an alarm or disconnect a battery. Voltage: Total voltage as well as individual cell voltage; the minimum and maximum voltage attributed to a cell or periodic tap voltage. Temperature: Coolant intake temperature, average temperature, coolant output temperature and individual cell temperature. State of charge: This parameter measures a battery's charge level. State of health: Conditions of overall health are evaluated to measure overall battery vitality. Coolant flow: This measure is used in batteries that are cooled by air or fluid. Current flow: Measures the current flowing into or out of a battery. First, determine if the device needs to be part of a complete battery management system that can take action to both monitor and regulate battery charging and operation. This will establish if a stand-alone battery monitor is appropriate. It also confirms the presence of a pre-existing integrated battery management system. In cases where no integrated system is present, the information provided helps determine if one can be utilized or is required. Stand-alone battery monitors that account for variables that affect operating capacity, such as Peukert efficiency, are especially important. Grainger Industrial Supply | Eagle Eye Power Solutions, LLC | Duncan Instruments Canada, Ltd.